It’s time to post my wish list for the 3rd quarter of the 2015 Finish-a-long hosted by Adrianne at On the Windy Side. I have 3 in progress projects that I would like to finish. 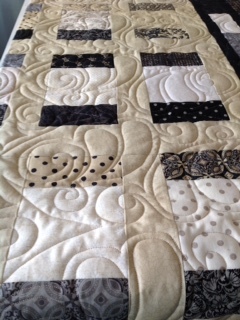 First is my little black dress quilt. It was on my 2nd quarter list and also on the May and June ALYoF list but still hasn’t been completed. I have most of the FMQ done and then I have to add a label and bind it. It is a gift for someone and it has to be finished by the end of August so hopefully I will make my goal this time. 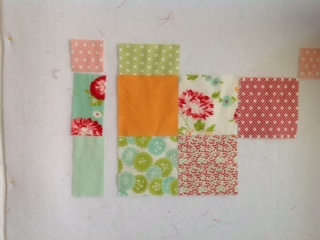 Second is a lap quilt that is in the planning and piecing stages. I had a couple of charm square bundles of Scrumptious from Bonnie and Camille. I am making up the design as I go along so I don’t really know how the final quilt top will look. 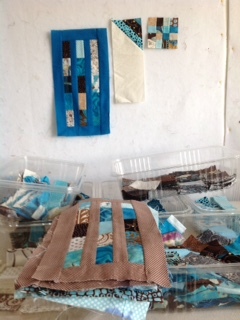 And last but not least I have started Leftovers V. I am using strips and small rectangles left over from my Blue Odyssey Quilt. I’m also planning on incorporating leftover blocks from Blue Odyssey and Leftovers III somewhere in the quilt. Litle Black dress is pretty ‘Snappy’ very, very cute!